My dad grew up in North Carolina and an early brush-with-fame story he likes to tell me is that Andy Griffith, who died this week at age 86, was his high-school speech-class teacher in 1952. The part of my dad's story that I love is when Andy -- who insisted upon being called "Mr. Griffith" by his not-much-younger students -- asked to borrow my dad's tape recorder to practice his stand-up comic routine. My dad says he may have been the only one in all of Goldsboro (other than the radio station) to own a tape recorder. He had ordered it from Montgomery Ward, and Griffith kindly returned it to my dad when he was done with it. The last time my dad chatted with Griffith was in 1959 on West 45th Street in New York City. He was on his way to a matinee performance of Destry Rides Again. Andy played the title role and it was a smash success. Andy saw my dad first and shouted "Mackie!" My dad said it was amazing that Andy remembered a student's name from six years earlier. My dad talked about the new job he had just started teaching in Spartanburg, South Carolina. And Andy said he had really hated teaching high school. Another small detail to that story is that I was convinced, when my dad first started telling that story, it wasn't a tape recorder but rather a typewriter that Griffith took a likin' to. But my dad is adamant that it wasn't a typewriter (which he says everyone but him had in 1952, whereas a tape recorder was much more rare), so I suppose he's right. Odds are for many of you, the very name "Andy Griffith" calls to mind that image of Andy and Opie (a young Ron Howard, one of the most adorable children ever to amble across a TV screen) with fishing poles over their shoulders. And not just the image; surely you're also humming that theme song? 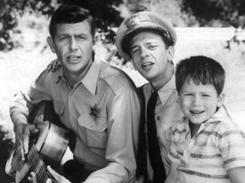 As Sheriff Andy Taylor, Griffith perfectly embodied one of America's favorite archetypes: the seeming country bumpkin who's actually smarter than anyone around. The difference with Sheriff Taylor was that there was really nothing bumpkinish about him. What marked him as stupid, to those visiting Mayberry from the outside, wasn't the way he behaved or thought, but the way he spoke, that slow, soft drawl peppered with country aphorisms. The writers often played up that contrast between Andy's soft speech and sharp mind, but never in a mean way — "mean" was not a part of the show's vocabulary. And neither were politics. At a time when the urban North and the rural South often seemed to be two separate but equally angry countries, The Andy Griffith Show was neutral ground, a place were we could all indulge in a little nostalgia for a more leisurely paced life. For that, you can thank Griffith, who set the show's gentle, understanding tone. Even his by-the-books, exposed-raw-nerve of a deputy Barney Fife— so brilliantly played by the inimitable Don Knotts— couldn't rile him, and Barney could have riled a saint.